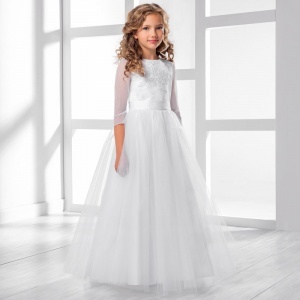 Girls lace & tulle 3/4 sleeve dress, made by Lacey Bell style CD29, perfect for her first holy communion or an older flower girl. Complete with Lacey Bell tags, hanger and dress cover packaging. 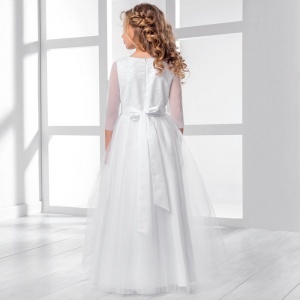 Available in sizes 7 - 12 years, please click on the Size Guide tab above to view all measurements. This stunning dress is made to order just for you, by UK designers 'Lacey Bell', so once you have placed your order please allow the sufficient time (as quoted when you select the size) for completion prior to dispatch (more information will be provided after you have placed your order). For urgent order's, please contact us prior to ordering to enquire. Please check and compare all measurements for the dress prior to ordering to ensure you select the correct size as the designers will not be able to amend once work has commenced. If the child falls between sizes, we would recommend to go up a size. Custom measurements are also available on request to amend the chest, waist or length of the dress. Please contact us prior to ordering to enquire.